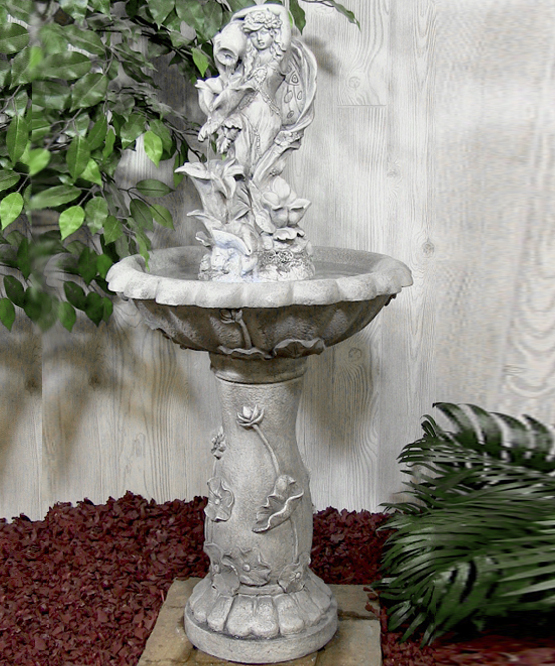 The Fairy Flower Solar on Demand Water Fountain will add fantasy to your landscape, as well as the soothing sights and sounds of gently flowing water. LED lights in the basin add subtle light at night so that the fairy definitely gets noticed! 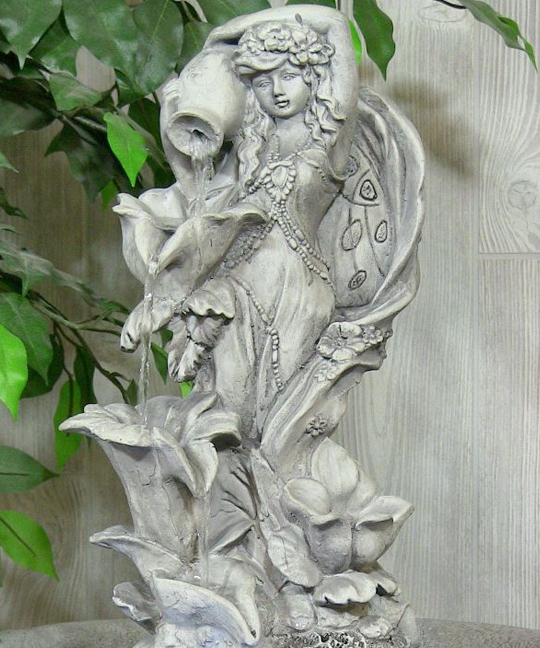 She holds a jug of flowing water that tumbles down one flower to the next. 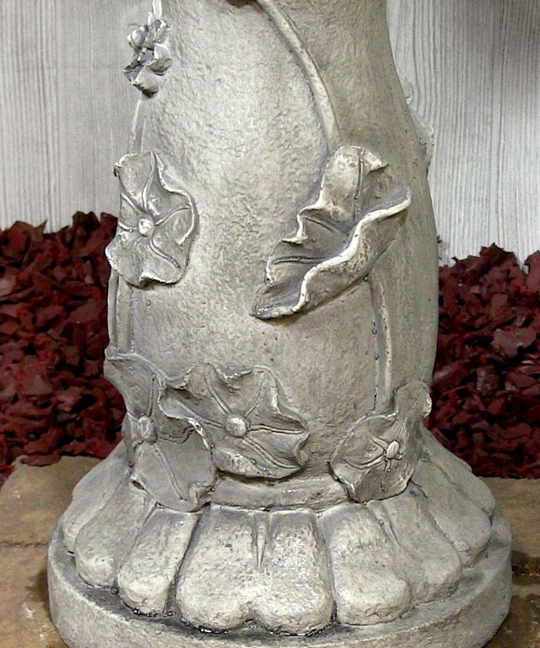 Whimsical but tasteful, the pedestal has detailed flower reliefs. Built of durable and color-fast resin, this has the look of ceramics or stone without the weight, cost or maintenance. Enough about its good looks! The fountain's pump operates both directly from the solar panel and from rechargeable batteries with a flip of a switch. This lets you choose when the fountain will run, including up to 4 hours of power for cloudy days or evenings. In good sunlight conditions, the pump is powered by solar energy from the panel. The panel also provides energy stored in rechargeable batteries. When the batteries energy is used up, the system automatically switches to powered by the solar panel, and the fountain will resume running when the sun come out. If you have a special occasion when you definitely want the fountain to work, solar on demand is the perfect solution without moving to electric pumps. Just set the pump in the off position for two or three days before the event so that even if there is only partial sun, the batteries will be fully charged when the event begins. Dimensions: Basin is 20.5 inches in diameter; the pedestal is 10.75 inches in diameter. Note: batteries typically last 12-18 months, but with repeated charges and discharge cycles the battery will become less efficient and battery capacity may reduce. If this occurs, boost charge the battery by turning the fountain "off" for 2-3 sunny days to allow maximum charge to the battery. Rechargeable batteries are available through most hardware stores and home centers for less cost than purchased online, but can be ordered through us if that is most convenient for you.